It's high noon at the Zombie Corral! The second supplement to All Flesh Must Be Eaten visits the Wild West. This tome is written by the Origins award-winning Shane Lacy Hensley of the Deadlands: The Weird West roleplaying game. 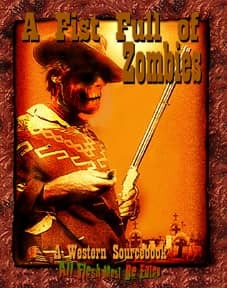 This book will present all new western Deadworld settings, new archetypes, weapons and zombies. As well as conversion notes for the Deadlands RPG. Format: 7.25" x 9.25" Softcover, 140 pages, black and white interior.